I originally planned to find a second-hand dresser on Craigslist and then refinish or paint or whatever. But after all the work I put into the planks and trim I just couldn't talk myself into another major project! I took the easy way out and went to Ikea to pick up a Hemnes. 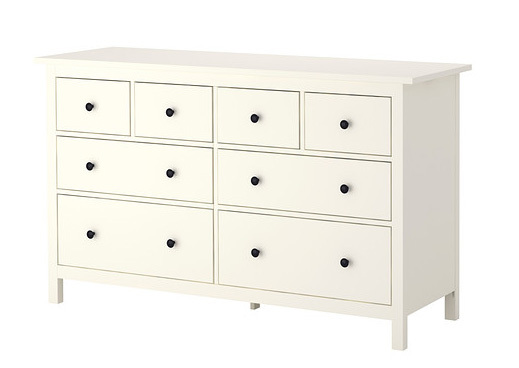 I looked at a couple cheaper options from other places and kept coming back to the Hemnes 8-drawer dresser. 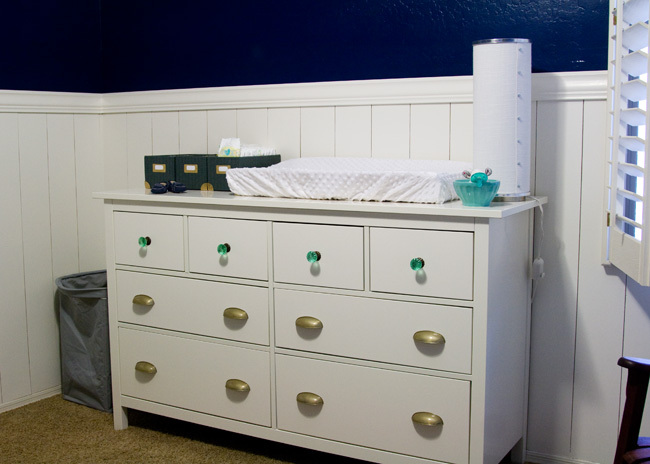 It's a great height for a changing table and the drawers slide out so smooooth. Plus, lots of storage! I couldn't just leave it as-is though, obviously. I wasn't willing to do a major alteration but fun knobs? I could do fun knobs. 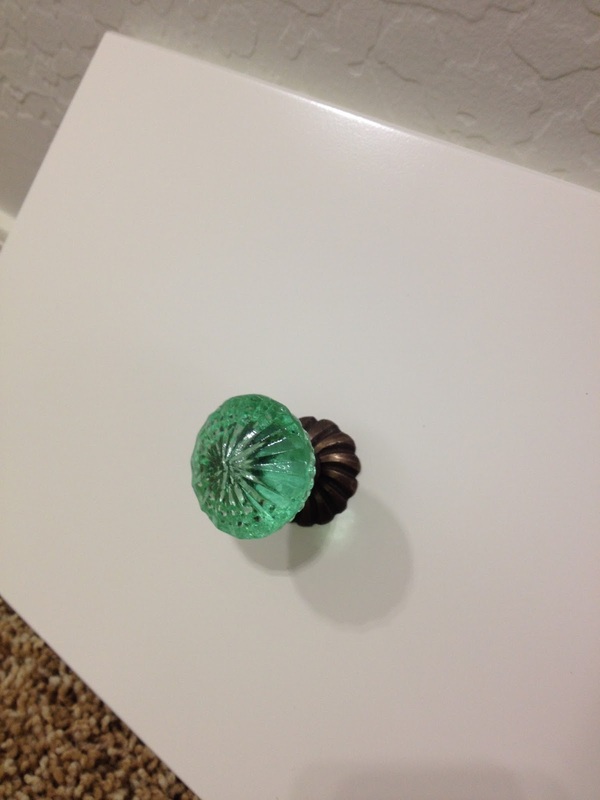 Anthropologie had several pretty mint colored knobs on their website so I dragged my (whining, hot, unhappy) boys to the store (the workers LOVED us...) and spent some time pondering before I ended up with these simmered glass knobs, which look more minty and transparent in person than they did on the website. Because they're a little on the pricier side, I only bought 4 to use on the top drawers and went to Home Depot for the remaining 8 pulls. 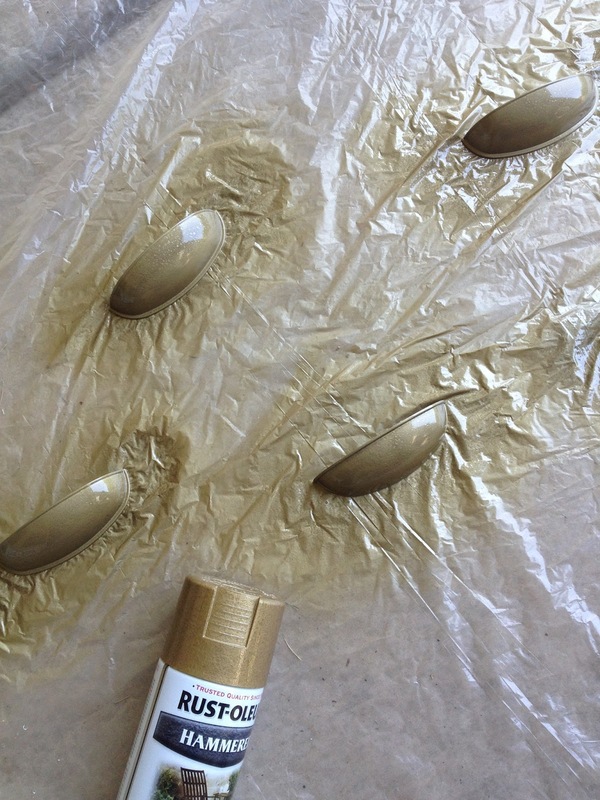 Gold options were limited so I ended up buying these cup pulls and using my handy-dandy hammered gold spray paint to get the look I wanted. I just did a light sanding, a quick wash and dry, and then spray painted them out on our back patio. Since the drawer fronts were originally pre-drilled with only one hole we had to drill another pilot hole for each pull. Aaron, bless him, ended up taking it upon himself to handle that one morning while I was doing laundry. He got it done way more quickly and accurately than I could have! The longer this nursery project goes, the more I lose faith in my ability to measure things precisely. 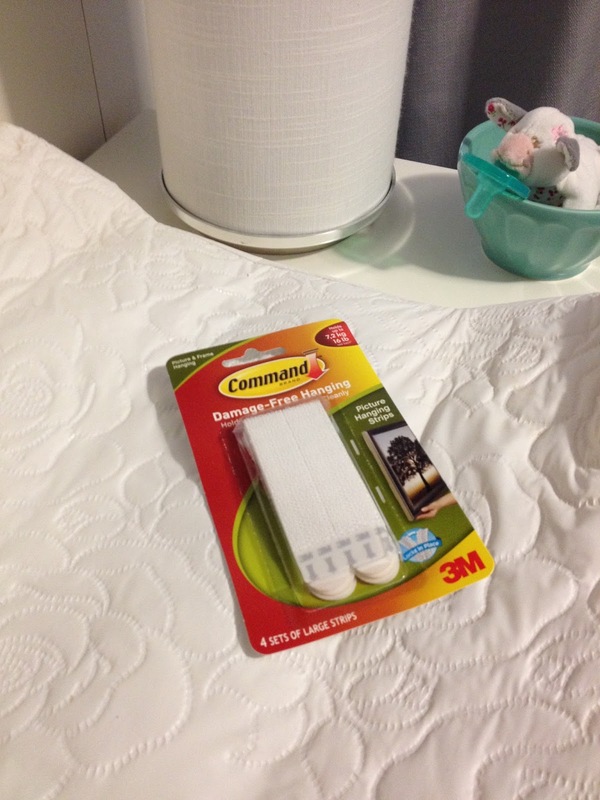 After assembling the Hemnes I attached the changing pad with 3M velcro strips. When we're done with the changing pad I can just remove the strips and there will be no permanent damage to the dresser. I got these little storage bins on clearance at Target ages ago. 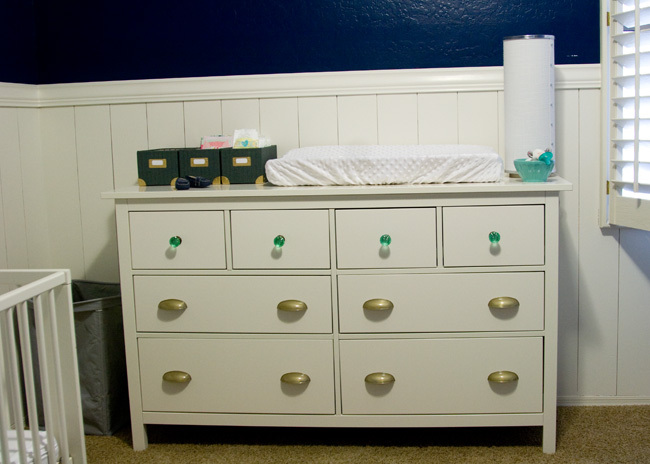 I used a paint pen to change the hardware from silver to gold (it was a good project for a really barfy day spent on the couch) and they're the perfect size for holding diapers and other changing table necessities. For now, the one on the left is holding bows. The one in the middle WILL hold wipes but right now contains cards from my baby shower, screwdrivers and hardware for the stuff I haven't finished yet. The one on the right holds newborn diapers, which, SO TINY I HAD TOTALLY FORGOTTEN. I picked up a latte bowl from Anthro while I was there for the knobs. 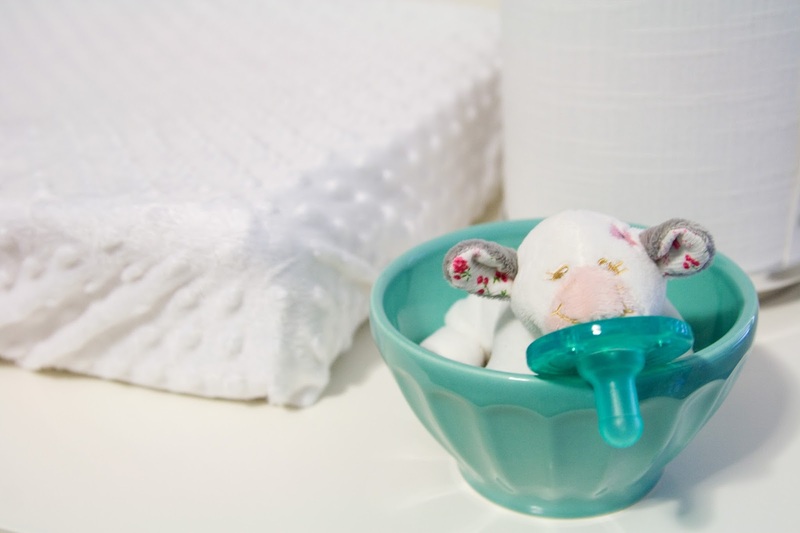 The color was right and I figured it was a good place for corralling binkies and whatnot. I could do a whole post about how much I LOVE WubbaNubs. Stinky spent 2 weeks in the NICU due to prematurity and they gave him one. We were instant converts! The original was looking a little shabby so my sister sent this sweet little cow one for baby E.
I stole the Ikea lamp from my bedroom. It should be sitting on my bedside table but I currently don't HAVE a bedside table so I wasn't really using the light all that much. It has a dimmer, which was my major requirement for any light that would go beside the rocking chair. Eventually I'll steal it back for my bedroom and I'll have to find another lighting option, but this works for now. 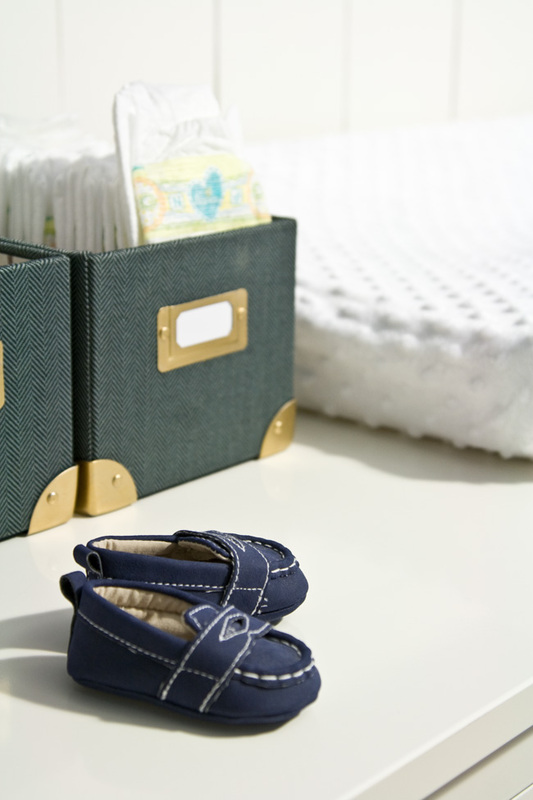 The nursery is getting SO close. I have to rehang the curtains because the rod was in a weird place and I have to figure out what I'm doing for art (first thing I started thinking about, last thing I seem to be able to make decisions about) and the room needs a trashcan (boooring), among a few other small things, but we are almost there!! Now that I've spent so much time in the room, though, I'm seriously considering a skylight or something. I knew the room was dark but I didn't know, you know? These pictures were taken at the time of day when the room gets the MOST light from its one small window and I still had to turn on the overhead light so there would be enough light for my camera to focus. The lack of light is great for a napping baby and toddler but I think eventually this kid isn't going to be quite so enamored of living in a cave. We'll cross that bridge when we come to it, I suppose! Yep, I love this. The more you post about it the more I love it. Love the knobs on the dresser. 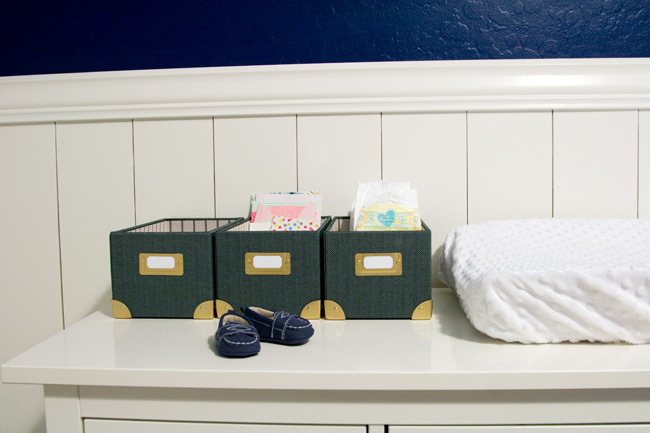 We have this exact dresser (in the dark brown/black) in our little boys room and use as a changing table. It's perfect height and will be great for years to come! Can't wait to see the finished room. You're seriously my favorite blogger right now. Love this dresser! I have it in the more woodsy color and it's sooo cute. Love what you did to this! Now I want to switch out my pulls!